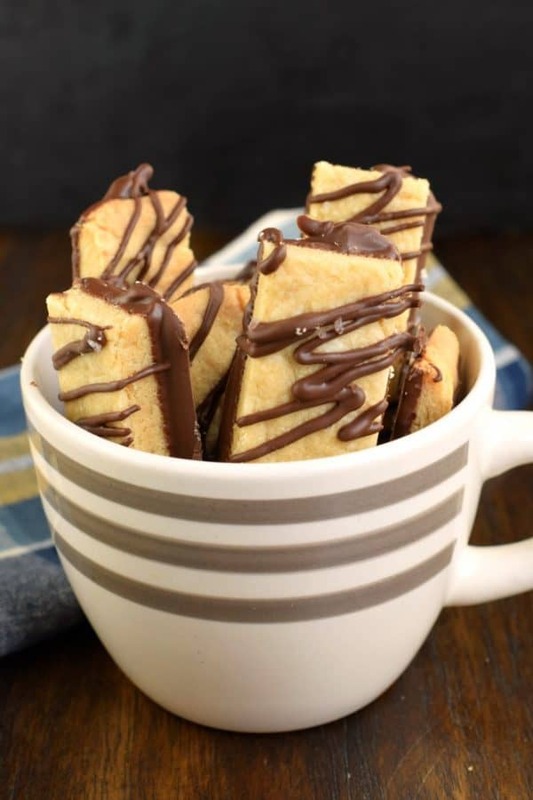 Buttery and delicious, these Dark Chocolate Peanut Butter Shortbread Cookies are the perfect dessert. Add a sprinkle of sea salt and your taste buds will thank you! Cookies. They’re delicious and evil all at the same time. You just want to eat one, and suddenly you’ve eaten one dozen! 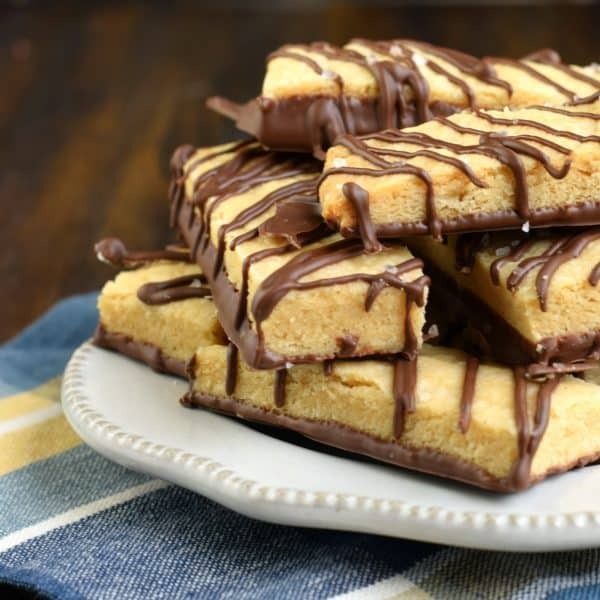 Today’s Dark Chocolate Peanut Butter Shortbread Cookies have a long name, but they’re easy to make and they melt in your mouth. 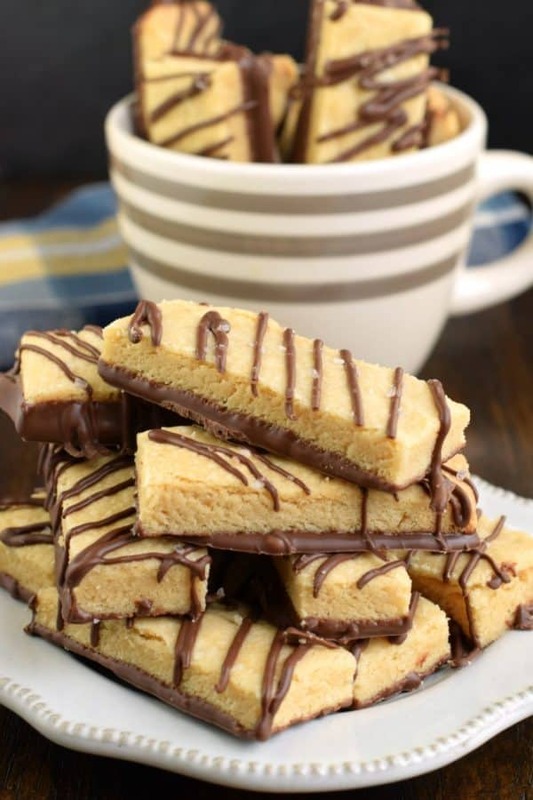 I’m a big fan of shortbread cookies, from vanilla bean shortbread cookies, to butterscotch shortbread cookies, they all have so much flavor in a buttery treat! One of my favorite things about shortbread cookies is that they only make a small batch. While some may see this as a downfall, I think limiting the number of cookies I could potentially eat in one sitting is a very good thing. I mean, you could always double the batch if you NEED more cookies! Start by using softened butter. You don’t want it cold, but you also don’t want it TOO soft. My favorite tip for add hot water to a tall glass and let sit for a few minutes. Pour out water and put empty glass over a stick of butter. Allow it to soften for about 5 minutes. Works like a charm! Once your butter is ready, preheat your oven to 350 degrees F and line a large baking sheet with parchment paper. 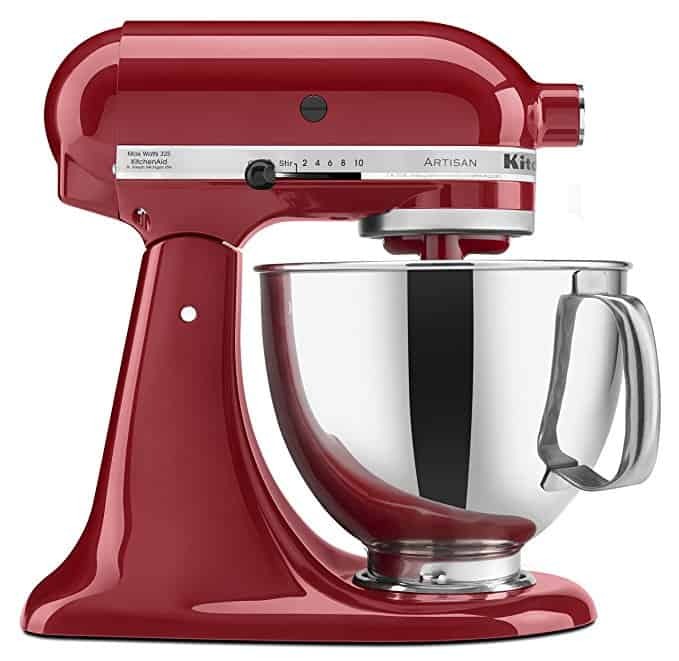 In a mixing bowl, combine your butter with powdered sugar, and peanut butter until creamy and smooth. Add in flour, salt, and milk. Mix until combined. The dough might be slightly crumbly at this point. Use the warmth of your hands to press it together and combine it as much as possible. Drop dough onto parchment paper and press into a 12×10-inch rectangle that is about 1/4-inch thick. If you still have some crumbs, press them into shape! Bake cookies for about 20-25 minutes, until edges begin to lightly brown. Remove from oven and immediately cut into bars using a pizza cutter or large knife. Cool completely. Once cooled, dip bottom of cookie in melted chocolate. I love using Ghirardelli chocolate wafers for this. 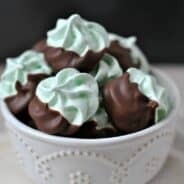 You can also drizzle the extra chocolate over the tops and add a pinch of coarse sea salt! Store in an airtight container at room temperature for up to a week. ENJOY. Q: Why do shortbread cookies spread when I bake them? A: Typically if you’re finding that your cookies are spreading, I suggest you chill your dough before baking. This allows the fats (butter) to re-solidify making it more difficult to spread in a short baking time. Also, when softening your butter, don’t let it get TOO soft (see notes above)! Also, this recipe uses regular creamy peanut butter, not a natural one. 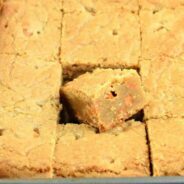 Q: Why is my shortbread dough crumbly? A: This is normal. For the most part. First, double check your ingredients to make sure that you have used the correct amounts. Second, make sure your butter is softened and you are using creamy peanut butter. When you drop the dough onto your parchment paper, if it’s still crumbly, use your warm hands to help press it back together (if your hands are cold, run them under some warm water for a minute!). Q: Can I substitute margarine for butter in shortbread cookies? A: Technically? Yes. However I don’t recommend this. First, margarine can be a little more difficult to manage, a little stickier. Second, you can’t beat the taste of butter. When you only have a few ingredients, you want them to stand out! In a good way! Q: How long will shortbread cookies keep? Stay fresh? A: In an airtight container at room temperature, you can keep shortbread cookies for about a week. If you choose to freeze your cookies, I usually say one month (although if I’m being honest I have totally kept frozen desserts much longer)! I’m pretty sure it’s a well known fact that sprinkles make everything taste better. These Funfetti Shortbread Cookie Sandwiches are no exception to that rule! Filled with sprinkles, these are sure to go fast! Buttery Shortbread Cookies with chocolate and cherries! These Cherry Chocolate Chip Shortbread Cookies are so easy to make and very pretty too! Don’t let these simple Apple Shortbread Bars fool you! While they are “just a bar” they are quite possibly the most amazing dessert ever! Buttery shortbread m&m cookies from Oh Sweet Basil! 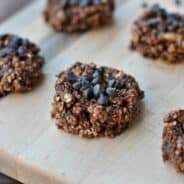 Everyone loves making these cookies for school lunches, picnics at the park, or lazy Sunday afternoons! Pretzel Toffee Shortbread Cookies from Crazy for Crust are a fun way to dress up the original shortbread cookie. A quick and easy shortbread cookies recipe with toffee chips and crushed pretzels. 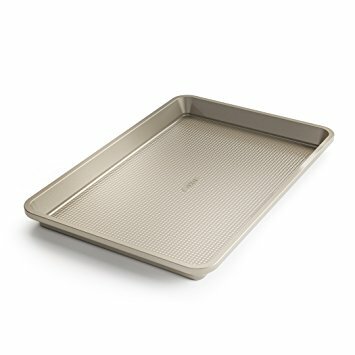 Line a 15x10-inch baking sheet with parchment paper. Set aside. Preheat oven to 350 degree F.
In a large mixing bowl, beat butter with powdered sugar and peanut butter until creamy. Add in flour, salt, and milk and beat until combined. Use heat from your hands to combine the crumbs of the dough. Drop dough into center of baking sheet, and using the heels of your hand, press dough into a large rectangle. You want the dough to be the same thickness throughout, so keep pressing until you have a rectangle about 12x10-inches and about 1/4-inch thick. Press any extra dough crumbs into the rectangle. Bake for 20-25 minutes, until edges begin to lightly brown. Remove from oven and immediately cut into strips using a pizza cutter. Cool completely. 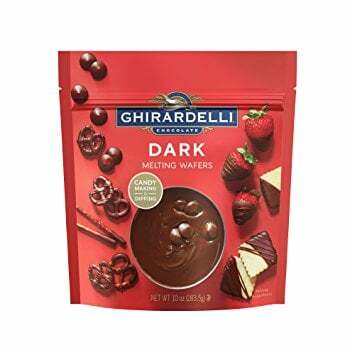 Melt dark chocolate melting wafers in a microwave safe bowl for one minute. Stir until smooth (you may need to heat an additional 30 seconds). Dunk bottom of each cookie into melted chocolate and place back onto parchment paper. Once all the bottoms have been dunked, drizzle remaining chocolate over the tops and immediately sprinkle with coarse sea salt, if desired. Store in an airtight container for up to 7 days. ENJOY. These were such a delicious take on a traditional shortbread recipe. We loved them! Usually I like cookies that are soft and chewy, but I make an exception when it comes to shortbread. I can’t resist the buttery, melt in your mouth goodness. And of course if you add peanut butter and chocolate, it’s even better. 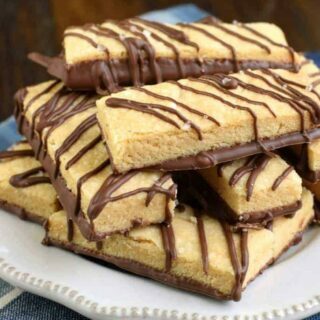 Cannot wait to make these! 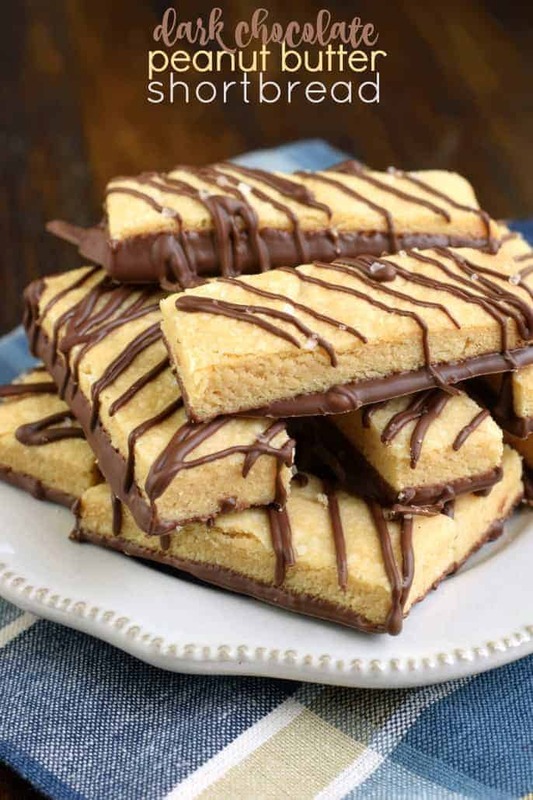 I have a weakness for shortbread cookies, I love all the chocolate drizzled!